Since we moved to LA about a month ago, I haven’t had much motivation to cook for the blog. The complete newness of the geography, culture and lifestyle here has been so overwhelming (in a good way) that thinking of new ideas for dishes keeps getting pushed back with the countless discoveries of restaurants, beaches, places to visit and things to do here. The constant assembly of dishes in my head had stopped for the first time in years, but I didn’t miss it or feel its absence. But we are settling in fine now, establishing a routine and getting familiar with the novelty of living here. I was recently inspired to cook this dish after discovering an Asian market out of the corner of my eye on the way to a job interview in Torrance last week. After picking up some gorgeous green cauliflower, striking out on finding fresh bird’s eye chilis and scoring some Onigoroshi, I exited the store with a singular mission to make General Tso’s Tofu, but with the green cauliflower as the base. This dish is all about crispy texture and clingy sauce working together to create the perfect bite. To achieve that ratio, I combined equal parts of cornstarch for crispness, AP flour for body and rice flour for a touch of softness, then adding cold fizzy water to create a tempura-like lightness throughout. 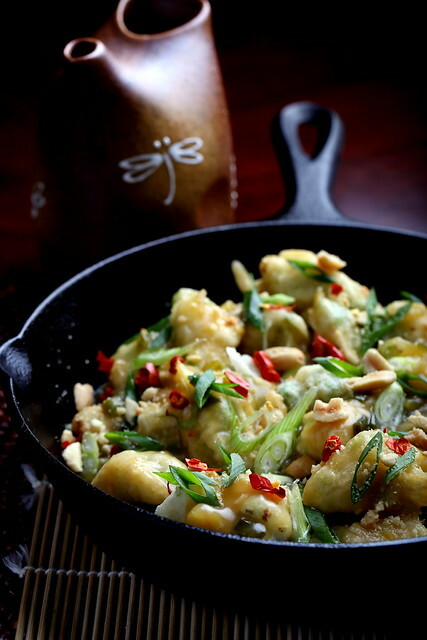 Once fried, the florets are tossed into a gingery-garlicky sauce slightly thickened with a cornstarch slurry until evenly coated, then served right away with a touch of heat, salty chopped peanuts and crisp scallions for a decadent and addictive dish. Place the sesame oil into a small saucepan over low heat. Add in the ginger and garlic, toss with the oil to coat, and allow to soften for about 10 minutes, stirring occasionally. Do not allow the garlic or ginger to brown. Add in the chopped scallions, stir, then increase the heat to medium. Saute for about 2 minutes, or until the scallions are bright green, then increase the heat to medium high. Once the pan starts to sizzle, deglaze it with the mirin. Next, add in the 1 cup of broth, sugar, soy sauce and rice vinegar. Allow the mixture to come to a small boil, then whisk in the cornstarch slurry and stir until thickened. Set aside to slightly cool. Combine the three flours and salt, then slowly add 3/4 cup of fizzy water. Stir until smooth, adding an additional 1/4 cup if needed. You want the batter to the thick but smooth so it clings well to the cauliflower. Set aside. Bring a large pot of water to a boil. Throw in the cauliflower florets and allow to boil and soften for about 4 minutes. Using a skimmer or tongs, remove the florets from the water and place onto a dish towel. Lightly fold the towel over and gently smoosh the cauliflower to get rid of some of the water. You just want to gently snap it—not smash it. 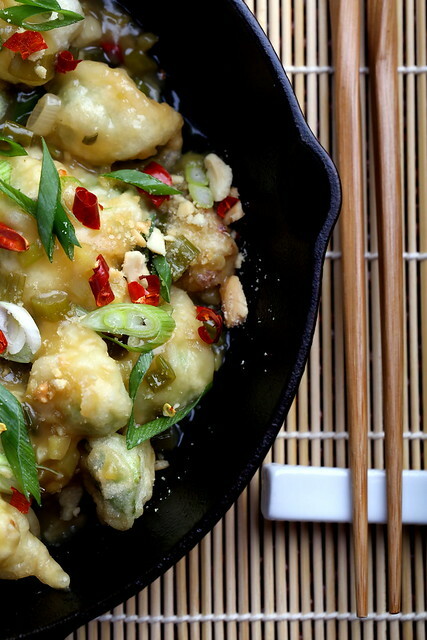 Throw the cauliflower florets into the batter and very gently stir with your hands to coat. Set aside. Place several inches of canola oil into a clean heavy pot over medium-high heat. After about 7 minutes, throw a pinch of batter into the pot. If it bubbles immediately, you are ready to fry. You can also insert a thermometer into the oil until it registers and maintains a temperature of 350 degrees. Working in small batches*, drop the battered florets into the hot oil. Using tongs or chopsticks, gently stir to ensure the batter doesn’t stick to the bottom of the pan. Allow to fry for a few minutes until the florets develop little golden specks. Transfer to paper towels to drain. *It’s important that you work in small batches here—overcrowding the pot will reduce the temperature of the oil resulting in soggy, greasy florets. To assemble the dish, toss the florets in the sauce until well coated. 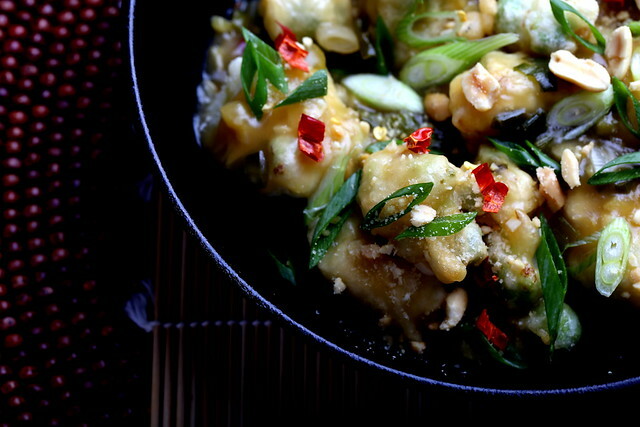 Serve with rice, hot peppers, peanuts and chopped scallions, if desired. Nice! 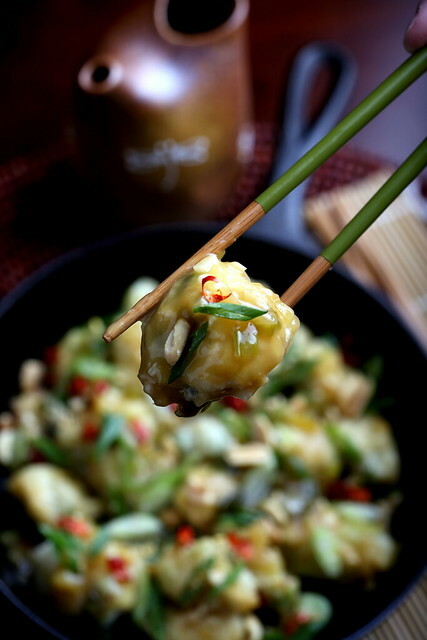 Did something similar a few months back with a take on Gobhi Manchurian (I guess Indian versions of Chinese dishes are a bit of a thing) – sauce was based on Sriracha, maple syrup and gochujang but besides that a lot like yours Cauliflower-wise. Looking around online I saw a lot of the Indian chefs doing this type of recipe would fry the florets twice for maximum crispiness. Obviously when they hit the sauce it's a bit of a texture timer being set. Fizzy water = smart touch! I will have to try that dish, it sounds fantastic! Amazing! I have a whole head of cauliflower that needs to be eaten today so I'm think this is for dinner. Glad you are enjoying your new place and culture in LA! Thank you Sarah — I hope you like! This looks wonderful, I must try it soon too! Thanks! Now that is a move!! wow! Culture shock indeed. Glad you are liking it. I will definitely try this. I love your General Tso w tofu. This sounds wonderful! I had a few questions…. 1. To convert this to gluten free, I'm thinking of subbing sorghum flour for the AP flour. Does that sound like a good fit? 2. The ingredients say 1/4 ginger. 1/4 of what measurement is that? Alicia, good catch! I've updated those two things in the ingredients list, and thanks for pointing that out! having just "enjoyed" my first Chinese meal for ages to celebrate my 60th birthday, and really not enjoyed the excessive glutineous mess at all, what a pleasure to read your blog:) looks so tasty – enjoy the experience of your new home! Thank you! and happy 60th birthday, Christine!